Click to allow users to send their photos via SMS. 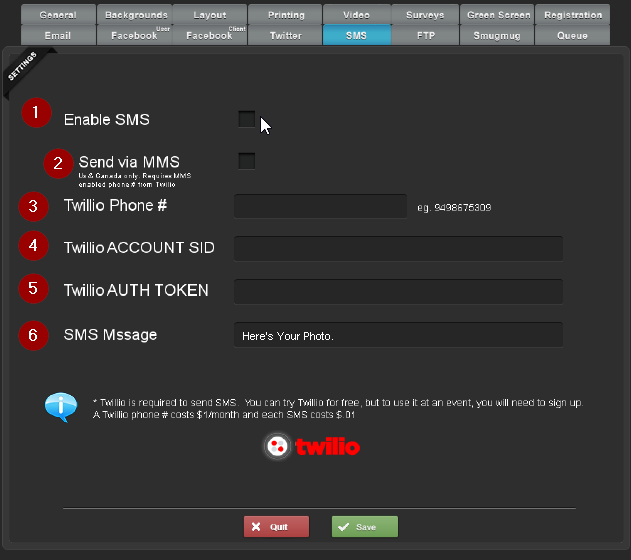 You will need to sign up to Twilio here to send SMS messages. Twilio is available in most countries and costs about $.01 per SMS. The user will receive a link to their photo as a text message. Click to allow users to receive their photo directly in their messaging. They will receive both the photo and a link to their photo. You will need a MMS enabled number from Twilio. Enter the message to accompany the link to your photo.